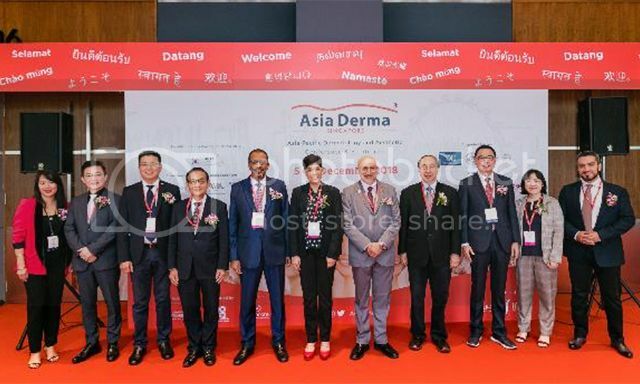 Asia Derma 2018 mirrors the success of the first Dubai Derma event, highlighting growth opportunity for the Asia Pacific region. L-R:Ms. Helene Mare, Asia-Pacific Sales Manager, Isispharma; Mr. Alan Teo, Managing Director, Aesthetics & Marketing Asia; Mr. Jimmy Ang, Managing Director, NeoAsia; His Excellency Mr. Ahn Young-Jip, Republic of Korea Ambassador to Singapore; His Excellency Dr. Mohamed Omar Abdulla Balfaqeeh, United Arab Emirates Ambassador to Singapore; Prof. Fatimah Binte Abdul Lateef, Singapore MP; Dr. Abdul Salam Al Madani, Executive Chairman, Asia Derma; Prof. Goh Chee Leok, Scientific Committee Chairman, Asia Derma; Mr. JT Youn, Chairman, IBITA; Ms. Rui Xuan Wong, representing KOTRA; Dr. Hassan Galadari, MD. Asia Derma, the only Asia Pacific Dermatology and Aesthetic Conference & Exhibition of its kind, has successfully concluded in Singapore. The event took place from 5th to 7th December 2018 at the Suntec Singapore Convention and Exhibition Centre. Over the course of 3 days, the event received a total 916 visits by conference delegates and trade visitors. Delegates attended talks by over 50 different speakers covering a myriad of topics on the latest treatments and advancements in therapeutic and aesthetic dermatology. The calibre and diversity of speakers, not only from the Asia-Pacific region but across the world, played a vital role in securing delegates to the event. Insightful topics and workshops also enabled attendees to discover and engage with their peers and dermatology specialists. Trade visitors attending the exhibition were given demonstrations of the latest products and devices from over 100 leading, innovative brands in the aesthetic and dermatological industry. With the Republic of Korea as the first Country of Honour for Asia Derma, there was also a special showcase of Korean brands. Delegates and trade visitors attended from Singapore and across the Asia-Pacific region. In this first edition of Asia Derma, Singapore-based delegates and trade visitors represented 46 percent of the audience, followed by 9 percent from Malaysia, 7 percent from Thailand, 6 percent from India, 4 percent each from Indonesia, Vietnam and Republic of Korea and 3 percent from Taiwan. The conference portion of the event was attended by dermatologists from clinics, hospitals and independent practices from across the region. Trade visitors at the exhibition were predominantly from hospitals (32 percent), distributors and agents of dermatology products and devices from the region (22 percent) and owners and buyers from aesthetic clinics (21.4 percent). He added “We are very excited to continue on building on the success of the first edition to continue serving the dermatology field and providing continuing medical education for the Asia Pacific region. Participants were thrilled and engaged with the scientific program and this encourages us to organise an even more exciting event next year. Our partners from industry were also pleased by the results at the exhibition and many have confirmed their support to next year’s event." Market research indicates Asia-Pacific to be the fastest growing market for dermatology devices and is a key driver for the quest for effective skincare solutions. The diverse makeup of the various markets in the region necessitates expert knowledge and experience. Asia Derma provides a unique platform for dermatologists and aestheticians to continually enhance their knowledge and skills. 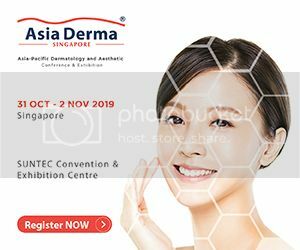 Asia Derma will be returning to Singapore on 31 October- 2nd November 2019. “Singapore is privileged to host this event. Asia Derma is bringing together practitioners, dermatologists, aesthetic physicians and industry partners from this region and other parts of the world to learn about what’s going on in our field globally, and what are the new developments. Individual countries will have to customise their needs according to the local population but knowing certain things from a global platform like Asia Derma is really important. We have a lot to learn from partners, therefore collaboration and interaction is really important, and is facilitated by such event”. - Mr. Jimmy Ang, Managing Director, NeoAsia, Silver Sponsor of Asia Derma. - Mr. Alan Teo, Managing Director, Aesthetic Marketing, Bronze Sponsor of Asia Derma. - Mr. Gabriel Serrano Sanmiguel, Chairman, SesDerma.